Unite’s Len McCluskey demolishes Jack Dromey MP as an ‘Olympic Sized Self Publicist’ and reveals far from ‘saving the car industry’ Gerard Coyne has never set foot in JLR. Speaking recently to shop stewards and members at Unite’s biggest branch – Jaguar Land Rover in Solihull – I was told an extraordinary thing. In all the years that Gerard Coyne, my opponent in the election for Unite general secretary, has been Unite’s West Midlands regional secretary, he has set foot just once in their workplace. It was something of a surprise therefore to read the claim of my former colleague Jack Dromey who, in another extraordinary intervention by a West Midlands MP in this election was giving his support to Mr Coyne, that my challenger takes credit for stopping the collapse of motor manufacturing in the Midlands. Tony Woodley, our general secretary at the time of the Rover crisis in 2005, tells me he can’t remember Gerard playing any part at all in the campaign to save jobs. If Gerard had then I would have thought that such an achievement would have won him the backing of Unite branches across the automotive sector here, and elsewhere in the UK. Yet all of JLR’s Midlands branches support me, along with BMW in Cowley, Ford in Daventry, and all nominating auto branches across the country. Their backing demonstrates my determination to secure a future for those working in an industry that faces many challenges, including a hard Brexit and automation, and that our auto members recognise Unite needs a general secretary who understands these challenges and is prepared to support them by working with the government and with employers to create decent jobs, maintain our place as a world-class industry and ensure the voice of a highly skilled and dedicated workforce is heard loud and clear. Jack has tried hard in his article to give Gerard an industrial profile that might shape up to mine. But, like Jack, Gerard has never worked in industry. He joined Unite after working at Sainsbury’s on Saturdays. Perhaps that lack of industrial experience is why he also failed to secure the nomination of the Unite branch at the iconic Cadbury factory. Yet even when trying to praise Gerard, Jack makes it all about himself and his own record. He really is an olympic-class self-publicist. What he doesn’t say about that record is that he was twice rejected by the union’s membership when he ran for general secretary. This gives him little to impart on how to give effective leadership – the members clearly did not want him. The first time he stood he was trying to unseat from office Britain’s first black general secretary and fellow Brummie Bill Morris – now Lord Morris of Handsworth. So much for the equality he claims to champion. Bill had, like me, worked in industry and been a shop steward before becoming a union official – he in the car industry, me on the docks. Jack Dromey invokes the memory and words of the great Jack Jones in his attack on me. Jack Jones wasn’t just a hero to me, but a dear friend. 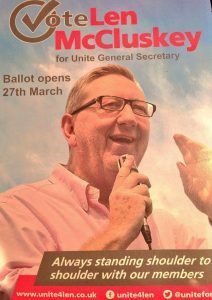 He would be appalled at how Jack Dromey is using his good name to promote a candidate whose campaign has been built on smearing Unite. He would have been aghast at how Gerard’s campaign attempted to disrupt Unite’s landmark auto industry conference held in Birmingham recently, where the future of the automotive sector, and therefore Unite members’ jobs, was being discussed. Worse, Gerard’s campaign is now apparently being supported by the far-right English Defence League. A prominent member of the EDL has been giving out Coyne campaign material outside Vauxhall’s Ellsemere Port plant. If Jack Dromey really wanted to walk in Jack Jones’ shoes, he would withdraw his support for Coyne now, and distance himself from his dirty tricks campaign. For while Jack and the Coyne campaign continue to sling mud and drag the great name of this union and its members into the gutter, I have been getting on with the day job. I was with Unite members in Hams Hall as they voted in droves to defend their retirement savings from BMW’s pensions pinching. They don’t want their union under the thumb of politicians and submissive when faced with bad bosses. They want a leader with mettle, who will be with them all the way. So I will continue to fight for Unite members’ jobs, their pay and conditions, for investment in their industries, for quality apprenticeships and skills and against the rise of insecure working, including zero hour and one hour contracts, while leading from the front in campaigning for a better future for all our members, their families and their communities. Len McCluskey is General Secretary of Unite – from the Birmingham Post.